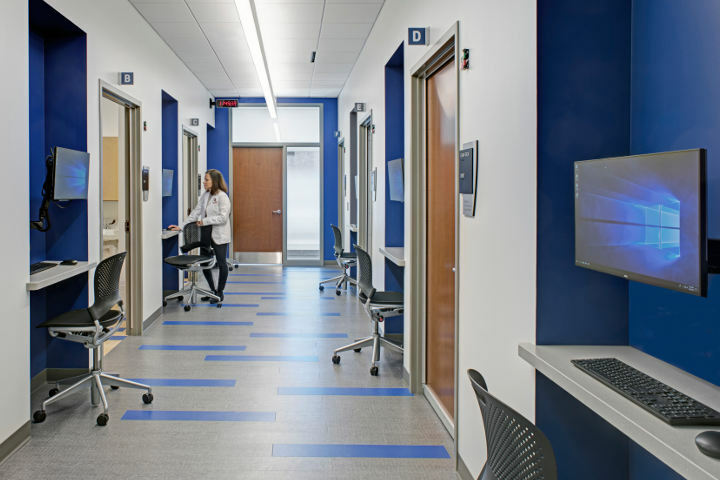 Classrooms and conference rooms in the Health Sciences Learning Center, Clinical Science Center, Wisconsin Institutes for Medical Research and UW Medical Foundation Centennial Building can be reserved online. Audio/visual equipment can also be checked out online. The Health Sciences Learning Center includes on-site security services provided by the UW-Madison Police Department, as well as locations for the University Book Store and DoIT Tech Store. Classroom and AV Services provides support with classroom and audio/visual needs in the health sciences complex including classroom and conference room scheduling, technology support and training, and videoconferencing and web conferencing support. View building access information and submit a question or comment about the Health Sciences Learning Center. Learn how to request a recording of an event or lecture, reserve audio/visual equipment, reserve rooms in any building in the health sciences complex and find information about library technology resources. The School of Medicine and Public Health and UW Health boast top-notch clinical education facilities that serve as training grounds for learners of various health professions and levels. View contact information for School of Medicine and Public Health employees in the Health Sciences Learning Center.